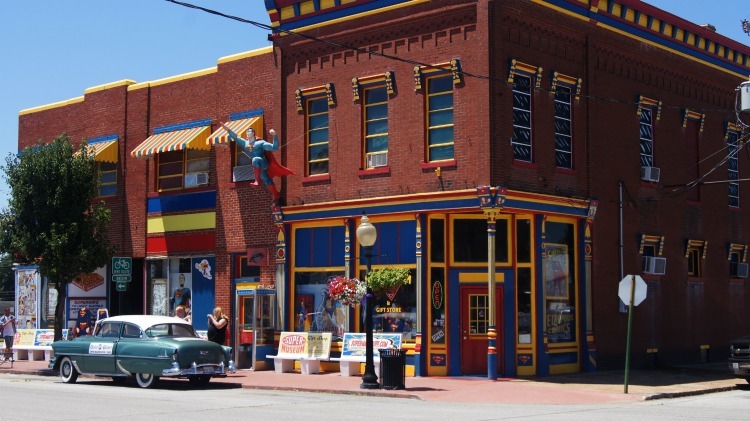 Pay homage to one of the nation’s most beloved and recognized superheroes of our time on a quick detour off the scenic route, or during a full-fledged summer celebration in Metropolis, Illinois. 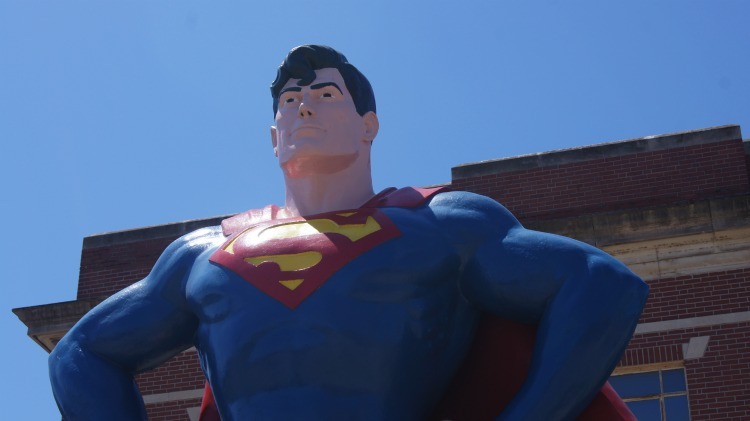 Superman’s self-proclaimed hometown collects and celebrates all things Superman all within short walking distance, and offers up big inner-child hugs and excitement to all those that knew and loved Superman regardless of generation. 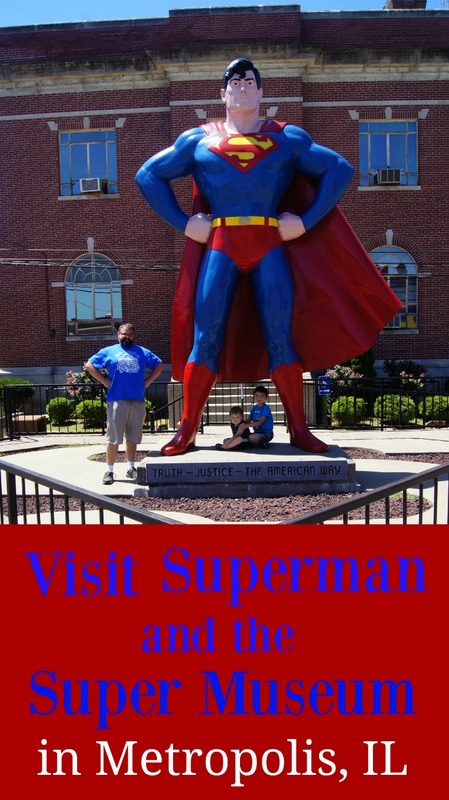 Visit Superman at the Super museum in Metropolis, IL. I’m all about soothing the inner child in your travels. New experiences have a way of renewing the soul and keeping us young, and this trip really fit that bill for us. We were on a long road trip with the kids on the scenic route between Missouri and Kansas when we looked down at the map and realized we would be traveling through Metropolis, IL. 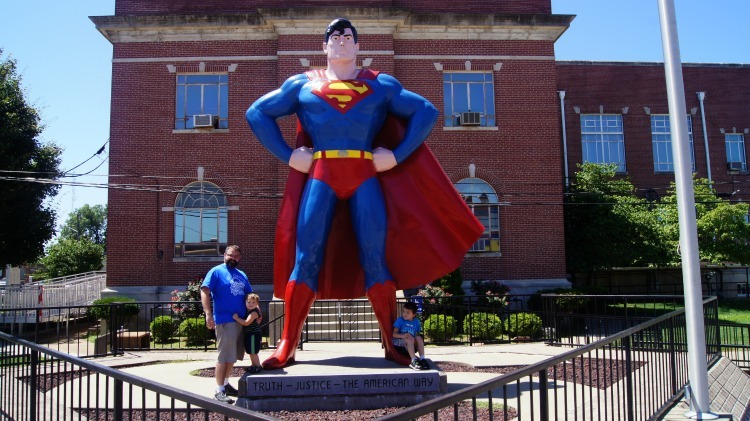 While we were on the road, I looked up Superman’s self-proclaimed hometown Metropolis, IL and saw that there was a giant Superman statue in the center of town. I knew this attraction was a must-see. My husband has stacks and stacks of his childhood comics saved by his mother all these years at her house; he has been a huge fan of Superman his whole life. He owns every Superman movie ever made and keeps close watch for the new ones. When we dressed up with the kids for Halloween, guess who he dressed up as? Superman. So we made an impromptu detour at the Metropolis exit and made our way into town. Family trips are often centered around activities for the kids, but for this part of the trip, our designated minivan driver perked up immediately. This time it was daddy’s turn! It was a neat opportunity to get to pay homage to his childhood hero. It also meant a lot to him to get this picture with the boys. What’s In The Super Museum? We all enjoyed hanging out in Metropolis. It’s an adorable town. After finding the statue, we were pleasantly surprised to see The Super Museum across the street, complete with an old model Daily Planet car, Superman and Supergirl cutouts for taking pictures, and of course a phone booth positioned out front. There are a lot of great photo opportunities outside the colorful museum. We paid the small admission fee into the museum ($5 for persons 6 and up, 5 and under free) and started our way through. It isn’t an elegant Smithsonian-style setup, but there are a great number of things to stop and see. 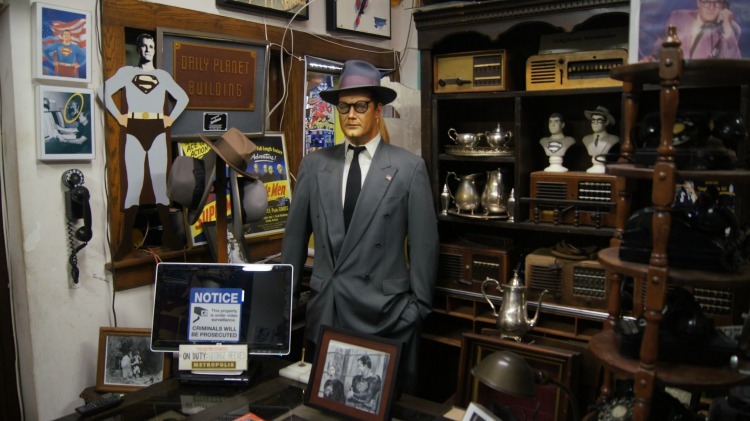 Tons of collectible items and relics from the movies and television shows, both old and new. It’s easy to spend a great deal of time seeing all of the memorabilia. I moved ahead with the kids’ faster pace and let daddy mosey on through. 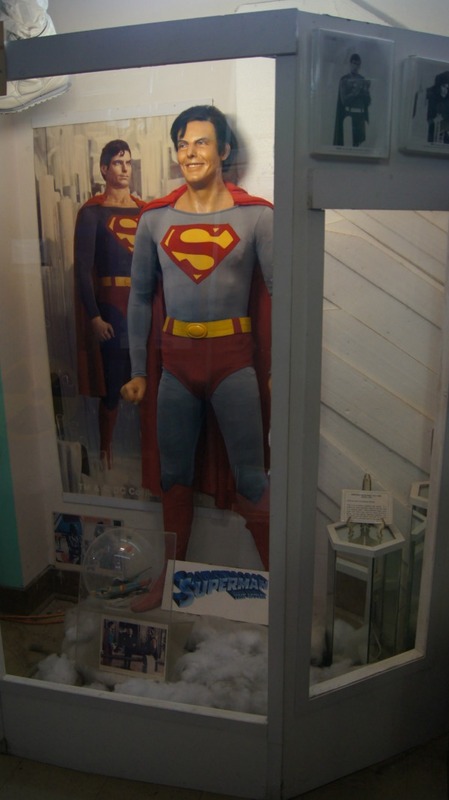 My husband’s favorite attraction was a Superman costume that Christopher Reeve wore during filming. I was pleasantly surprised to also see plenty of Lois Lane and Supergirl memorabilia as well. There is a large gift shop in the museum with just about anything you could ever want in a wide range of prices. We got the boys t-shirts and small Superman figures and my husband and I got matching Superman and Wonder Woman coffee mugs, complete with their own little capes. What Other Attractions Are There? We also discovered that every year they hold a Superman Celebration that spreads throughout Metropolis and spans the whole weekend. The summer festival in 2017 looks to be four jam-packed days of all things Superman. The festival includes multiple booths, tents, autograph sessions, games, educational activities, a car show, indoor and outdoor film viewings with Q&A sessions, costume contests, live music and of course the amazing people-watching of fans in costume. We are seriously considering a return trip because that would be right up someone’s alley! Within walking distance of the statue at Superman’s Square, there is also a bronze statue of Lois Lane, as portrayed by actress Noel Neill in the 1950’s television series Superman. You can easily make a whole day of celebrating Superman. We had already eaten before stopping to see the statue so we didn’t check out the restaurants, but we did see places to stop and eat within walking distance. Metropolis offers a little something for everyone, whether you want to get in touch with your inner child or get right back to your outer adult. 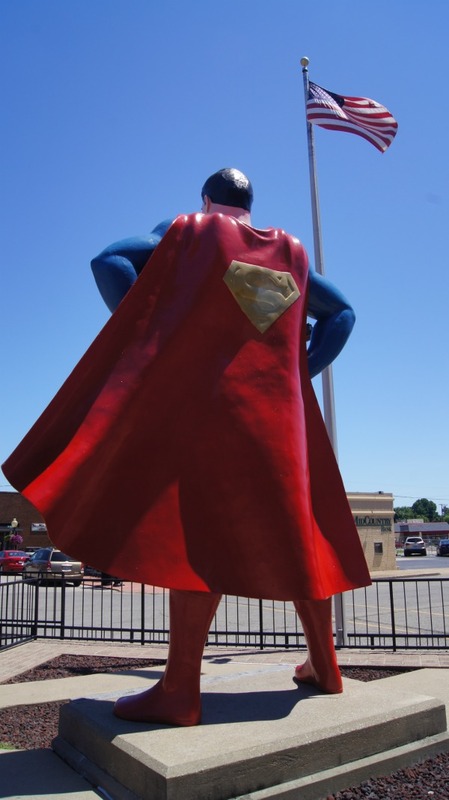 In addition to all things Superman, other attractions in Metropolis include Fort Massac State Park, the George Rogers Clark Discovery Trail, Metropolis Murals, Winery Tours of Southern Illinois, and a Harrah’s Casino. Why Is Superman So Important? Seeing Superman took me back to my childhood days too. I will never forget watching the Superman movies. I distinctly remember in Superman II when Lois Lane (Margot Kidder) fell straight into the Niagara Falls on purpose to see if Clark (Christopher Reeve) would rescue her. I remember watching his inner struggle of knowing he needed to do the right thing but still conceal his identity. He declined to outright rescue her and instead used his laser eyes to cut off a large log branch for her to hold onto and save herself. He was larger than life with the vulnerability of a human being and a heart like so many of the rest of us. It’s easy to see why attractions like this might mean so much to anyone that ever saw Superman in action fighting for the greater good. He is a widely recognizable symbol of good values and vulnerability. We see ourselves in our childhood superheroes, and that’s why Superman is so important. Laser eyes are pretty cool too. Audra Rogers was born and raised in small-town Kansas and followed her TV husband to his dream job in Nashville, TN. A TV news journalist herself, Audra slowed down to enjoy life and all things mom, and now works from home as a freelance writer. She stays encouraged in a slower paced life by collecting new experiences with her two young sons and staying in touch with her inner child. Audra encourages natural exploration as a brand ambassador for National Geographic Kids and has traveled to see things from Superman in Metropolis to the World's Largest Fork.